1Pathologist, Ministry of Health, Maisan, Iraq. 2Professor of Pathology, Department of Pathology and Forensic Medicine, Al-Nahrain University, Baghdad, Iraq. 3Lecturer in the Department of Pathology and Forensic Medicine, College of Medicine, Al-Nahrain University, Baghdad, Iraq. 4Pathologist, Ministry of Health, Baghdad, Iraq. *Address correspondence and reprints request to: Ban Jumaa Qasim, Lecturer in the Department of Pathology and Forensic Medicine, College of Medicine, Al-Nahrain University, Baghdad, Iraq. Chaloob MK, Ali HH, Qasim BJ, Mohammed AS. Immunohistochemical Expression of Ki-67, PCNA and CD34 in Astrocytomas: A Clinicopathological Study. Oman Med J 2012 Sept; 27(5):368-374. Objectives: To assess the immunohistochemical expression of Ki-67 and Proliferating Cell Nuclear Antigen (PCNA) as proliferative markers to study proliferative activity and CD34 as an endothelial cell marker in order to study vascular proliferation in astrocytomas in correlation with some clinicopathological parameters (age, gender, site of the tumor, and tumor grade). 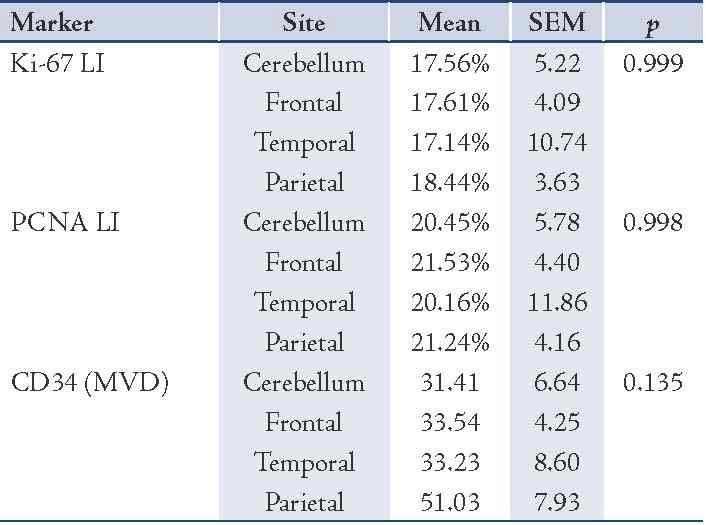 Methods: A retrospective study wherein a total of 51 formalin-fixed paraffin-embedded brain astrocytoma excisional biopsies covering the period of June 2009 to February 2011 were retrieved from the archival materials of the Specialized Surgical Hospital inMedical City in Baghdad, Iraq. The histopathological diagnosis had been revised and all cases were stained by immunohistochemical technique with Ki-67, PCNA, and CD34 tumor markers. Values were considered statistically significant when p<0.05. 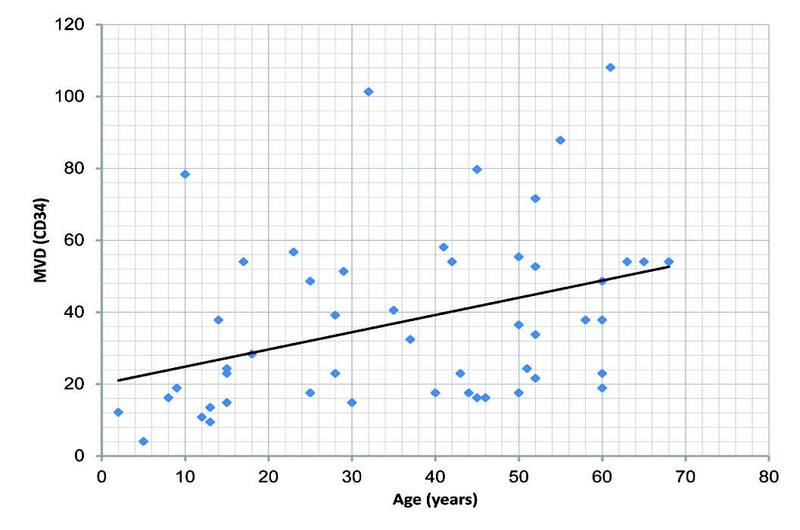 Results: Fibrillary astrocytoma (WHO grade II) was found to be the most common type among astrocytic tumors with the peak ageincidence of astrocytomas found in the second and fifth decades of life, and a slight male predominance had been identified. There was asignificant correlation between the age of the patients and the gradeof the tumor, Ki-67 and PCNA labeling indices, and microvessel density (MVD) detected by CD34 (p<0.05). There was a highly significant correlation between Ki-67 and PCNA labeling indices in astrocytomas (p<0.001). Conclusion: A significant correlation was found between Ki-67, PCNA labeling indices, and MVD (microvessel density) detected by CD34, and between the clinicopathological variables of astrocytomas (age and grade of tumor). Hence, Ki-67 and PCNA, as markers for proliferation, and MVD as a marker of angiogenesis, could be used as ancillary methods in the differentiation of borderline grades of astrocytomas. Keywords: Ki-67; PCNA; CD34; Astrocytomas. Microvessel density (MVD) is quite a useful parameter in the evaluation of angiogenesis. Studies revealed that MVD by CD34 is significantly different between normal brain tissue and astrocytoma. MVD is increased with the progression of the pathological grade of astrocytoma. Significant differences of MVD were found among astrocytomas of different grades. Thus, high MVD may be a contributing factor to the invasive growth of astrocytoma.12 The aim of the present study is to assess the immunohistochemical expression of Ki-67 and PCNA as proliferative markers to detect proliferative activity and the presence of CD34 as an endothelial cell marker to study vascular proliferation in astrocytomas in correlation with some clinicopathological parameters (age, gender, site of the tumor and tumor grade). In this retrospective study, a total of 51 formalin-fixed paraffin-embedded brain excisional biopsies from Iraqi patients covering the period from June 2009 to February 2011. The study included 22 cases of diffuse fibrillary astrocytomas, 16 cases of glioblastomas, 7 cases of pilocytic astrocytomas and 6 cases of anaplastic astrocytomas were retrieved from the archival materials of specialized surgical hospital in medical city. All the clinicopathological parameters (such as age, gender, site of tumor and tumor grade) were obtained from the available histopathological reports. Ethical approval was obtained from the institution in which the study was carried out in order to enable us to record patients’ clinical data from their files. From each block, 4 sections of 4 µm thickness were taken. One section was stained with hematoxylin and eosin (Fig. 1) for revision of the histopathological diagnosis, and the other 3 sections were stained immunohistochemically using three steps-indirect streptavidin method for Monoclonal Mouse Anti-Human Ki-67 Antigen (MIB-1), clone M 7240, (manufactured by DAKO) Denmark, Monoclonal Mouse Anti-Rat Proliferting Cell Nuclear Antigen (PCNA), Clone PC10, (manufactured by DAKO) and Monoclonal Mouse Anti-Human CD34, clone QBEnd-10, (manufactured by DAKO, Denmark). Technical negative controls were obtained by omitting the primary antibody for the three markers under identical test condition, respectively. Sections from a lymph node with follicular lymphoid hyperplasia known to be immunoreactive for Ki-67, PCNA and CD34 were used as a positive control (as recommended by the manufacturer). 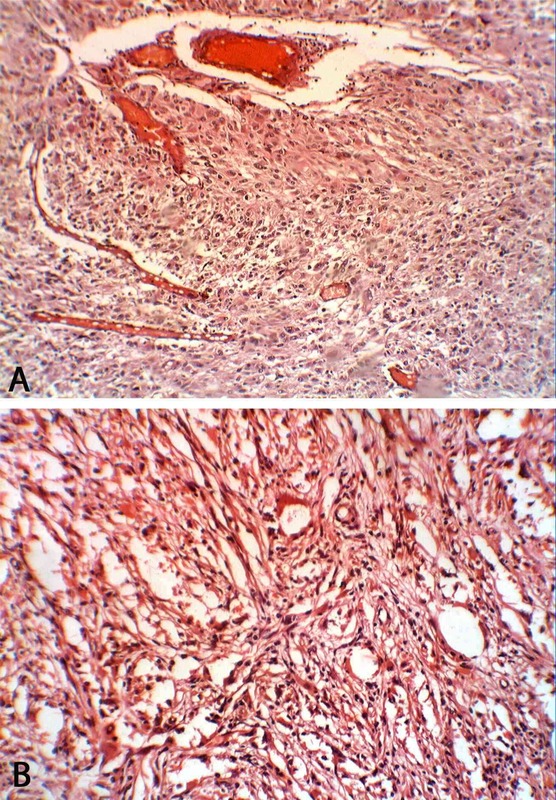 Figure 1: Glioblastoma multiforme (grade IV) stained with H& E demonstrating marked cellularity with marked hyperchromatism and pleomorphism. Note the prominent vascularity as well as the area of necrosis. (A) At power (×10); (B) At power (×40). Figure 2: Glioblastoma multiforme (grade IV) stained immunohistochemically with anti-Ki-67 showing positive brown nuclear expression of Ki-67 with large number of stained nuclei reflecting active cellular proliferation (arrows) (×40). 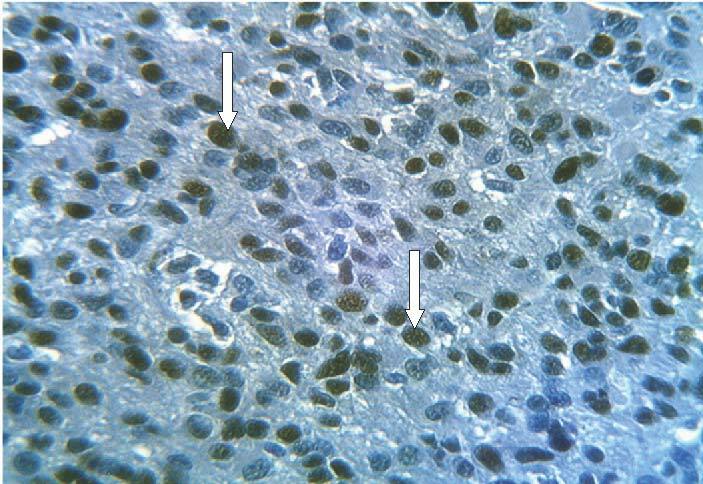 Figure 3: Glioblastoma multiforme (grade IV) stained immunohistochemically with anti-PCNA showing positive brown nuclear expression of PCNA (diffuse or granular stained nuclei) with large number of stained nuclei reflecting increased cellularity (arrows) (×40). 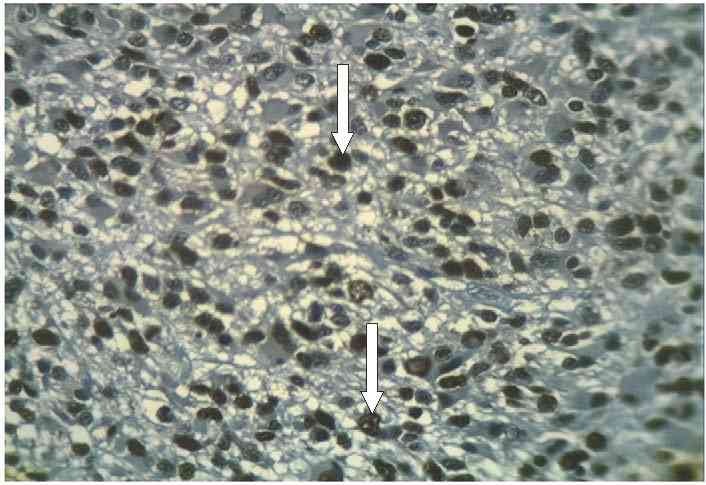 Figure 4: Glioblastoma multiforme (grade IV) stained immunohistochemically with anti-CD34 showing positive brown cytoplasmic staining of endothelial cells and marked microvessels proliferation(arrows) (×10). Statistical analysis was performed using SPSS V. 17 (statistical package for social sciences) and Excel 2007 programs. Data analysis was done using t-test and Spearman rank correlation for two continuous variables, ANOVA (analysis of variance) test for more than two continuous variables. Data were expressed as mean±SEM (the standard error of the mean). Values were considered statistically significant when p-value is less than 0.05. The mean±SEM of age for cases enrolled in the present study was 35.98±2.67 years with a range of 2-68 years. Statistical analysis showed that the two peak incidences of astrocytomas were found in the second and fifth decade of life. Gender distribution of brain astrocytoma cases showed slight male predominance with 27 (53%) cases compared to female with 24 (47%) cases; male to female ratio was 1.125:1. Regarding the site of astrocytoma, 17 (33.3%) cases were frontal, 16 (31.4%) cases were cerebellar, 13 (25.5%) cases were parietal and 5 (9.8%) cases were temporal. When the tumor grade is taken into consideration, 7 (13.2%) cases were pilocytic astrocytomas (WHO grade I), 22 (43.1%) cases were fibrillary astrocytomas (WHO grade II), 6 (11.8%) cases were anaplastic astrocytomas (WHO grade III) and 16 (31.4%) cases were glioblastomas (WHO grade IV). In the studied cases, the mean ± SEM of Ki-67 LI was 17.76%± 2.46 with a range of 0% to 70% whereas the mean±SEM of PCNA LI was 20.98% ± 2.71 with a range of 0% to 80%. Regarding the CD34 antibody, the mean ± SEM of MVD was 37.3 ± 3.43 with a range from 4.05-108.1. 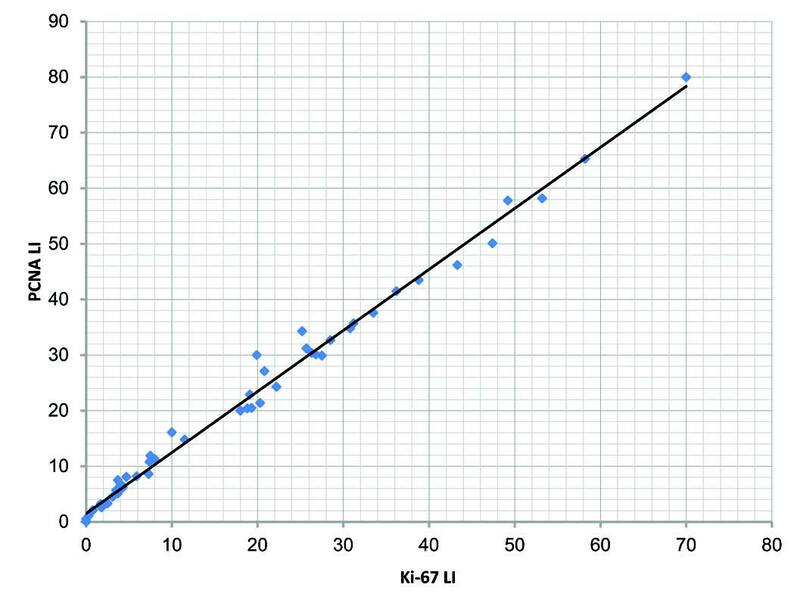 Figure 5: Correlation of Ki-67 labeling index (Ki-67 LI) with the age of the studied cases, (r=0.407; p=0.003). 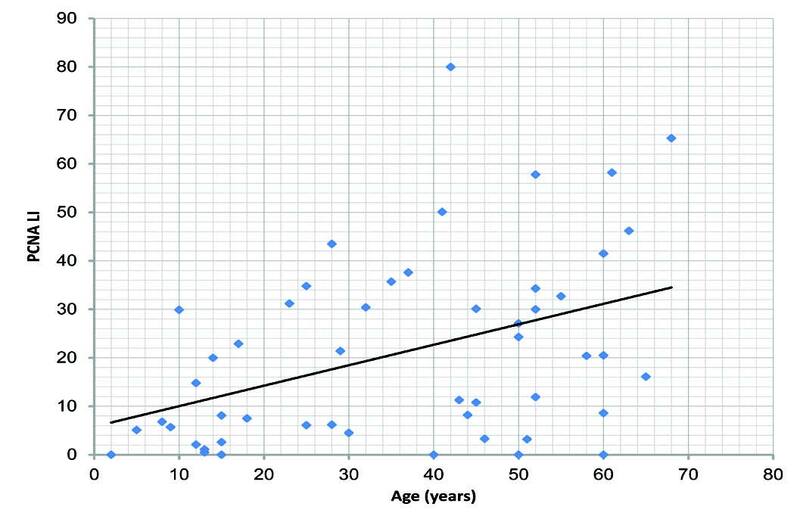 Figure 6: Correlation of PCNA labeling index(PCNA LI) with the age of the studied cases, (r=0.416; p= 0.002). 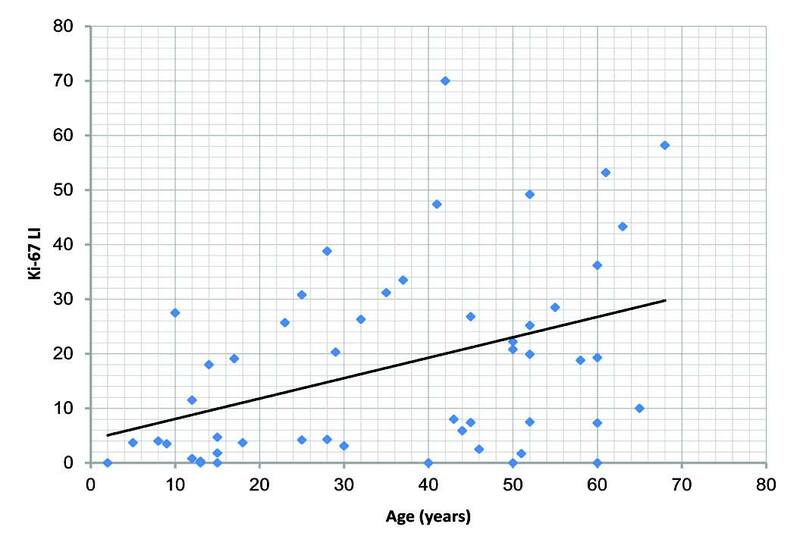 Figure 7: Correlation of microvessel density (MVD) with the age of the studied cases, (r=0.373; p=0.007). Table 1: Correlation of Ki-67 labeling index (Ki-67 LI), PCNA labeling index (PCNA LI) and microvessel density (MVD) with the gender of the cases. 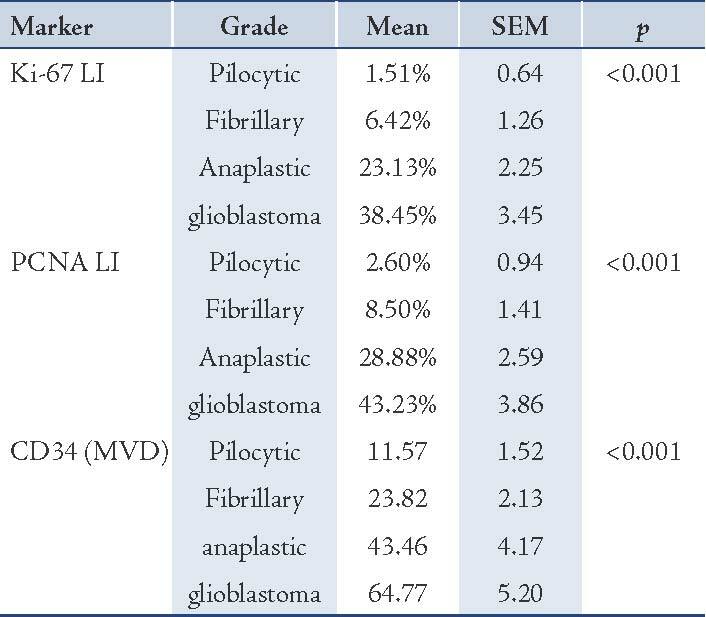 Table 2: Correlation of Ki-67 labeling index (Ki-67 LI), PCNA labeling index (PCNA LI) and microvessel density (MVD) with the site of astrocytomas. Table 3: Correlation of Ki-67 labeling index (Ki-67 LI), PCNA labeling index (PCNA LI) and microvessel density (MVD) with the histopathological grade of the cases. Figure 8: The correlation between Ki-67 labeling index (Ki-67 LI) and PCNA labeling index (PCNA LI) in the studied cases (r=0.995; p<0.001). The present study found no significant correlation between gender and Ki-67 LI (p>0.05). This result is in agreement with the results of the studies done by Mahzouni et al.1 Abdelaziz et al.16 and Liwei and Xiuzhen19; however, a study done by Yonghua et al.20 demonstrated a significant correlation between gender and immunohistochemical expression of Ki-67. This discordance could be attributed to environmental, racial and geographical differences, in addition to the difference in the sample size and antibodies used for the detection of Ki-67 antigen. A significant correlation has been found between Ki-67, PCNA labeling indices and MVD detected by CD34 immunohistochemical expression and clinicopathological variables of astrocytomas (age and grade of tumor); hence, Ki-67 and PCNA, as markers for proliferation, and MVD as a marker of angiogenesis, could be used as ancillary methods in the differentiation of borderline grades of astrocytomas. The authors would like to thank the College of Medicine/Al-Nahrain University particularly Department of Pathology and Forensic Medicine, and the staff at the teaching laboratories of Al Khadhmiya Teaching in Hospital in Baghdad/Iraq, for their help and support throughout the work. The authors reported no conflict of interest and no funding was received in this work. 1. Mahzouni P, Mokhtari M, Amirmansour B. Differentiation between reactive gliosis and astrocytomas by MIB-1/ki67 immunostaining. JRMS 2007;12(5):241-245. 2. Kumer V, Abbas AK, Fausto N, Mitchell RN. In: Robbins and Cotran, Basic Pathology, 8th ed, Elsevier, Philadelphia, USA, 2007:860-882. 3. Iraqi cancer registry, 2005. 4. Louis DN, Ohgaki H, Wiestler OD, Cavenee WK, Burger PC, Jouvet A, et al. The 2007 WHO classification of tumours of the central nervous system. Acta Neuropathol 2007 Aug;114(2):97-109. 5. Habberstad AH, Gulati S, Torp SH. Evaluation of the proliferation markers Ki-67/MIB-1, mitosin, survivin, pHH3, and DNA topoisomerase IIα in human anaplastic astrocytomas–an immunohistochemical study. Diagn Pathol 2011;6:43. 6. Gözü H, Bilgiç B, Hazneci J, Sargın H, Erkal F, Sargın M, et al. Is Ki-67 index a useful labeling marker for invasion of pituitary adenomas? Turkish Journal of Endocrinology and Metabolism 2005;4:107-113. 7. Ambroise MM, Khosla C, Ghosh M, Mallikarjuna VS, Annapurneswari S. Practical value of MIB-1 index in predicting behavior of astrocytomas. Indian J Pathol Microbiol 2011 Jul-Sep;54(3):520-525. 8. Johannessen AL, Torp SH. The clinical value of Ki-67/MIB-1 labeling index in human astrocytomas. Pathol Oncol Res 2006;12(3):143-147. 9. Bowers DC, Gargan L, Kapur P, Reisch JS, Mulne AF, Shapiro KN, et al. Study of the MIB-1 labeling index as a predictor of tumor progression in pilocytic astrocytomas in children and adolescents. J Clin Oncol 2003 Aug;21(15):2968-2973. 10. Malhan P, Husain N, Bhalla S, Gupta RK, Husain M. Proliferating cell nuclear antigen, p53 and micro vessel density: Grade II vs. Grade III astrocytoma. Indian J Pathol Microbiol 2010 Jan-Mar;53(1):20-23. 11. Kayaselçuk F, Zorludemir S, Gümürdühü D, Zeren H, Erman T. PCNA and Ki-67 in central nervous system tumors: correlation with the histological type and grade. J Neurooncol 2002 Apr;57(2):115-121. 12. Yu-hong Z, Jie-ying Z, Ai-rong C, Yu-mei M, Heng-shu W, Yue-hong L, et al. Expression and significance of TIP30, VEGF and CD34 in brain astrocytoma. Cancer Research and Clinic 2009;21(7):444-446. 13. Edilson S, Airlane A, Benedito S. Ki-67 and Bcl-2 antigen expression in adenomatous colorectal polyps from women with breast cancer. Society of Surgical Oncology 2010;17(9):2378-2383. 14. Lumachi F, Ermani M, Marino F, Iacobone M, Baldessin M, Cappuzzo G, et al. PCNA-LII, Ki-67 immunostaining, p53 activity and histopathological variables in predicting the clinical outcome in patients with parathyroid carcinoma. Anticancer Res 2006 Mar-Apr;26(2A):1305-1308. 15. Zhang YH, Yang Q, Cui W, Liu YX, Liu SX, Yao X. Correlation of microvascular density and clinicopathological factors in different subtypes of renal cell carcinoma. Zhonghua Zhong Liu Za Zhi 2010 Feb;32(2):117-122. 16. Abdelaziz OS, El-Sabaa BM, Abdelaziz A. Characterization of cancer stem cells in patients with brain astrocytomas: a clinicopathological and immunohistochemical study. Bull Alex Fac Med 2010;46(4):357-363. 17. Rodríguez-Pereira C, Suárez-Peñaranda JM, Vázquez-Salvado M, Sobrido MJ, Abraldes M, Barros F, et al. Value of MIB-1 labelling index (LI) in gliomas and its correlation with other prognostic factors. A clinicopathologic study. J Neurosurg Sci 2000 Dec;44(4):203-209, discussion 209-210. 18. Isolan GR, Ribas Filho JM, Isolan PM, Giovanini A, Malafaia O, Dini LI, et al. Astrocytic neoplasms and correlation with mutate p53 and Ki-67 proteins. Arq Neuropsiquiatr 2005 Dec;63(4):997-1004. 19. Liwei Y, Xiuzhen W. Expression and clinical significance of PTEN and Ki-67 in hmnan astrocytoma. Jiangsu Medical Journal 2010;36(5):73-75. 20. Yong-hua R, Guo-ying W, Yi W, Xian Z. Study on the expression of VEGF and Ki-67 related to malignant transformation of astrocytoma. Medicine and Pharmacy of Yunnan 2003;1:18-22. 21. Atik E, Serarslan Y, Bakaris S, Savas N. The importance of proliferative activity and angiogenesis in meningioma and glioma. Turk Neurosurg 2005;15(4):176-181. 22. Huang Y. Expression and significance of hypoxia inducible factor-1α, Ki-67 and microvessel density in diffuse infiltrating astrocytoma. Clin Exp Med 2010;23:51-56. 23. Scott IS, Morris LS, Rushbrook SM, Bird K, Vowler SL, Burnet NG, et al. Immunohistochemical estimation of cell cycle entry and phase distribution in astrocytomas: applications in diagnostic neuropathology. Neuropathol Appl Neurobiol 2005 Oct;31(5):455-466. 24. Georgescu CV, Săftoiu A, Georgescu CC, Ciurea R, Ciurea T. Correlations of proliferation markers, p53 expression and histological findings in colorectal carcinoma. J Gastrointestin Liver Dis 2007 Jun;16(2):133-139. 25. Ang LC, Plewes M, Tan L, Begley H, Agranovich A, Shul D. Proliferating cell nuclear antigen expression in the survival of astrocytoma patients. Can J Neurol Sci 1994 Nov;21(4):306-310. 26. Ripple H. P53 oncoprotein, PCNA expression and their signification in human astrocytoma. Master’s thesis posted on August 19, 2010.In: China Papers (online). Available at: http://mt.china-papers.com. Accessed February 28, 2012. 27. Chu SH, Yuan XH, Jiang PC, Li ZQ, Zhang J, Wen ZH, et al. The expression of hepatocyte growth factor and its receptor in brain astrocytomas. Zhonghua Yi Xue Za Zhi 2005 Mar;85(12):835-838. 28. Lebelt A, Szkudlarek M, Guzińska-Ustymowicz K, Lemancewicz D, Zimnoch L, Dziecioł J. Proliferative activity of chosen central nervous system (CNS) neoplasms. Rocz Akad Med Bialymst 2004;49(Suppl 1):242-243. 29. Yan D, Ling Y, Yu Y, Fulin S, Ming Y, Di JY, et al. Expressions of VEGF, bFGF, PCNA and P53 in human brain astrocytoma. Progress of Anatomical Sciences 2006;12(3):221-223. 30. Li-jun W, Ke X, Guo-guang F. Magnetic resonance spectroscopy of human astrocytoma and the correlation with the expression of Survivin and PCNA. Chinese Journal of Medical Imaging Technology 2008;24:11-15. 31. Bin X, Jun S, Luohe X, Zhimin X. Transforming growth factor α and tumor proliferation cell nuclear antigen in astrocytic tumors. Chinese Journal of Clinical and Experimental Pathology 2006;4:93-97. 32. Maiti AK, Ghosh K, Chatterjee U, Chakrobarti S, Chatterjee S, Basu S. Epidermal growth factor receptor and proliferating cell nuclear antigen in astrocytomas. Neurol India 2008 Oct-Dec;56(4):456-462. 33. Sadanaga H. Immunohistochemical analysis of cell proliferation in gliomas using proliferating cell nuclear antigen. Bull Yamaguchi Med Sch 1994;41(3-4):99-104. 34. Zimnoch L, Kozielec Z, Lewko J, Cylwik B, Mariak Z. Proliferative activity of glial neoplasms of the brain. Neurol Neurochir Pol 1999 Jan-Feb;33(1):87-96. 35. Leon SP, Folkerth RD, Black PM. Microvessel density is a prognostic indicator for patients with astroglial brain tumors. Cancer 1996 Jan;77(2):362-372. 36. Izycka-Swieszewska E, Rzepko R, Borowska-Lehman J, Stempniewicz M, Sidorowicz M. Angiogenesis in glioblastoma–analysis of intensity and relations to chosen clinical data. Folia Neuropathol 2003;41(1):15-21. 37. Lebelt A, Dziecioł J, Guzińska-Ustymowicz K, Lemancewicz D, Zimnoch L, Czykier E. Angiogenesis in gliomas. Folia Histochem Cytobiol 2008;46(1):69-72. 38. El-Sayed M, Taha MM. Immunohistochemical expression of cycloxygenase-2 in astrocytoma: correlation with angiogenesis, tumor progression and survival. Turk Neurosurg 2011 Jan;21(1):27-35. 39. Yuhong Z, Jie-Ying Z, Ai-Rong C, Yu-Mei M, Heng-Shu M. YueHong L, Wen-Xin W, Xiang-Hong Z. Expression and significance of TIP30, VEGF and CD34 in brain astrocytoma. Cancer Research Clin 2009;21(7):444-449. 40. Zhi-qin C, Xia G, Yan-xia S. Correlation of MMP-9 and FLT-1 expression with microvessel density in astrocytoma. Chinese Journal of Clinical and Experimental Pathology 2008;24:6-9. 41. Fulin S. The correlation study of VEGF, PIGF and children astrocytoma grading and prognosis. Available at http://www.lw23.com/lunwen_1016637247/. Accessed on 23/11/2011. 42. Jang FF, Wei W, De WM. Vascular endothelial growth factor and basic fibroblast growth factor expression positively correlates with angiogenesis and peritumoural brain oedema in astrocytoma. J Ayub Med Coll Abbottabad 2008 Apr-Jun;20(2):105-109. 43. Mahzouni P, Mohammadizadeh F, Mougouei K, Moghaddam NA, Chehrei A, Mesbah A. Determining the relationship between "microvessel density" and different grades of astrocytoma based on immunohistochemistry for "factor VIII-related antigen" (von Willebrand factor) expression in tumor microvessels. Indian J Pathol Microbiol 2010 Oct-Dec;53(4):605-610. 44. Korkolopoulou P, Christodoulou P, Kouzelis K, Hadjiyannakis M, Priftis A, Stamoulis G, et al. MDM2 and p53 expression in gliomas: a multivariate survival analysis including proliferation markers and epidermal growth factor receptor. Br J Cancer 1997;75(9):1269-1278. 45. Kordek R, Biernat W, Debiec-Rychter M, Alwasiak J, Liberski PP. Comparative evaluation of p53-protein expression and the PCNA and Ki-67 proliferating cell indices in human astrocytomas. Pathol Res Pract 1996 Mar;192(3):205-209. 46. Choi YM, Kim TY, Yoon KJ, Moon HB, Kim JM. A comparative study on MIB-1, AgNORs and PCNA expressions in astrocytic tumors. J Korean Neurosurgery Soc 1997;26(4):476-485. 47. Sallinen PK, Haapasalo HK, Visakorpi T, Helén PT, Rantala IS, Isola JJ, et al. Prognostication of astrocytoma patient survival by Ki-67 (MIB-1), PCNA, and S-phase fraction using archival paraffin-embedded samples. J Pathol 1994 Dec;174(4):275-282.